Claypool Elementary sixth grade students recently made a donation of livestock to the Heifer Project. CLAYPOOL — Claypool Elementary School sixth-grade students recently enriched the lives of others through the donation of livestock to the Heifer Project. The project allowed students to donate two Flocks of Hope to be shared with those in need in Guatemala. The flocks consist of chicks, goslings and ducks and allow those receiving the donation to raise the animals to use as livestock within their community. The project has received more than $9 million for the foundation with Claypool students raising more than $120 this year for the two Flocks of Hope. In previous years, Claypool sixth grade classes donated a water buffalo, chickens, fish, ducks and rabbits to the Heifer Project. The goal of these donations is to develop compassion and enrich the lives of others — both of which are foundational precepts of Warsaw Community School Corporation. 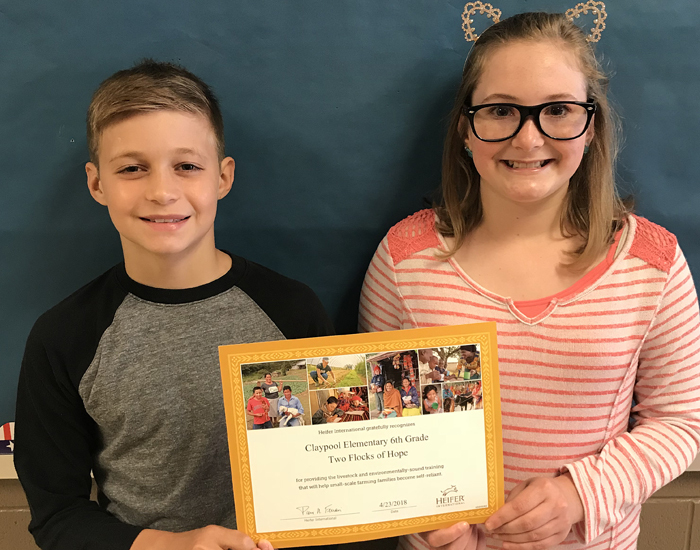 Along with the donation, Claypool sixth-grade students develop compassion through the study of videos and stories demonstrating kindness and compassion for others.